Great looking metallic design MP4 Player Watch. Wear this Watch with genuine leather strap anywhere you want, and people will never realize that a cool PMP is actually what they are looking at. A CSTN vibrant display will make sure that watching videos is a wonderful viewing experience. 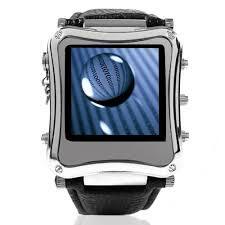 Keep up with the fashion get yourself a high tech dress watch today.